AKA: Where did my Mum Wine & Dine when she visited the Bay? Back in July a certain someone asked me to name eight restaurants to which I'd take my foreign foodie visitors when showing off the tastes of San Francisco. The request was answered with rather more than eight suggestions in the post I wrote here. In an attempt to stop my mother succumbing to jet lag on the evening of her arrival I dragged her a couple of blocks down the street to my favourite local wine place, Yield, where we propped ourselves up at the bar and shared English bubbles with the staff, tasty flat breads (the vegan Tomato Sauce, Roasted pepper and Oregano was my favourite from the menu that night) and glasses from their list of biodynamic, organic and sustainable wines. - Was Yield a part of my original Visitor Guide? YES! Tried and Tested: Fred and I have visited Yield so many times that we now count the staff as friends. Mum Delivers Her Sentence: A friendly place to drop in for a drink and snack. Mum was desperate to meet a certain little dog and his wonderful parents so we made an outing of it and headed up to Napa to try out lunch at Ubuntu, an applauded new vegetable restaurant where the feisty, fresh, cured green olive appetizer turned a few heads. The four of us shared everything but found only one worthwhile item per course. After the bright olives, (and passing quickly over the sickly, salty-sweet lavender almonds which sat by their side) we were happily silenced by a homey warm salad of Little organic potatoes and torpedo onions whilst being concurrently non-plussed by a green salad (with brown edges), persimmon and pomegranate. Moving on, I'd suggest that visitors from San Francisco skip past Ubuntu's pizzas - be they Nettle and Crescenza or mushroom because you can find a better pie here, here, here or at your other favourite urban pizzeria. To make your hour-long journey worthwhile opt instead for the more unusual but satisfying Cauliflower three ways (puree, roasted and raw) - and served in a cute little cast iron Staub. This dish, with its contrast of flavour, texture and colour (smooth and tender through crunchy, creamy through spice-scented, white through purple to green), was exactly what I expected everything at Ubuntu to be. But the Brussel sprout dish, whilst equally unusual, was no near match on the satisfaction meter. Although I loved the creamy bed of grits on which the green orbs were perched, the bullyish smear of smoky sauce underneath was overwhelming whilst the adorning sticks of celery root perched on top seemed to have lost their usually bold personality. We had all decided against dessert until a flippant (but in retrospect clever) comment by our server led to us caving in and ordering the cheesecake, along with four spoons. Whimsically, it arrived in a clamped glass jar that begged for a ceremonious opening. Once the lid was unbuckled, a rather polite battle for the cloudy billows of cream covering a strata of buttery crumbled crust, drunken cherries and smeary vanilla-flecked cheesecake ensued, with the opponents not putting down their spoons until the very last fleck had been taken care of. - Was Ubuntu a part of my original Visitor Guide? NO! First Impression: This was my first visit to Ubuntu. Mum Delivers Her Sentence: The company was better than the food, the entree menu was disappointing, the chef spoilt the pizza with too much hot spice that was not so nice but the potatoes were moreish. The night before thanksgiving you need something light and sushi is the perfect choice. Luckily our local, Moshi Moshi, was open. It's not the best sushi in town, but for us it's the most convenient and it always hits the spot when I can't be bothered to cook. - Was Moshi Moshi a part of my original Visitor Guide? No! Tried and Tested: Fred and I eat here at least twice a month. He always has pork chop salad and/or gyozas. Mum Delivers Her Sentence: Only my second experience of visiting a sushi restaurant and surprise, surprise I enjoyed it. When a November 23rd is warm enough for bare feet and paddling and the air is so clear that you can see as far as Mount Diablo, there is nothing else for it, except a drive to Stinson Beach. We don't go there to dine, we go there for everything else. But if we have to eat, we'll do it at Stinson Beach Grill where everything looks twice as good as it tastes and we'll be smiling anyway because of all the fresh air and the gorgeous scenery. - Was Stinson Beach Grill a part of my original Visitor Guide? No! Tried and Tested: Scene of Fred and my first ever daytime date, Fred and I have visited Stinson Beach Grill a few times since. You know you are a regular when the owner has left instructions for the staff to ply you and your special visitor with complimentary champagne, even though he knows you are only stopping by for a drink. These are people I truly love. I call them my friends. - Was Cafe Bastille a part of my original Visitor Guide? Yes! Tried and Tested: Scene of Fred and my first ever dinner time date. He's been eating here almost weekly for over 10 years. Mum Delivers Her Sentence: We dropped in for pre-dinner drinks. I was surprised to see how lively it was with so many people eating outside, it had a great atmosphere. The staff were friendly and it does help that Fred is French and good friends with the owners who looked after us well. Treat 'em mean, keep 'em keen, Scott Howard is like a temperamental boyfriend that I love, hate and am constantly drawn to for more. My visit number eight in six months and I still can't get enough of it. Do you think they might start a frequent diner programme just for me?. - Was Scott Howard a part of my original Visitor Guide? Yes! Tried and Tested: Eight visits under my belt in less than 6 months. Mum Delivers Her Sentence: Good meal deal - delicious. Ahi Tuna tartare was the best, it melted in your mouth and I even got a recipe for the carrot broth. - Was The Ferry Building a part of my original Visitor Guide? Yes! Tried and Tested: I do 90% of my shopping here every week. Mum Delivers Her Sentence: Sam queued to get me a coffee from the Blue Bottle Coffee Co. I could not believe how long it took for staff to make one cup of coffee!, The best coffee in SF? Hmm not so sure about that. (slightly bitter rather than smooth). Mine and Fred's third visit to David Kinch's Los Gatos restaurant in a year was, from my point of view, my favourite visit to date too. Maybe because I drove and didn't drink too much, I could remember the whole wonderful experience more acutely. We had the tasting menu (18 courses if we counted correctly). It was wonderful from start to finish. David sent us complimentary champagne to begin with and then the good food just kept coming. The highlights? For me, the vegetables from the garden get me every time and the oyster with urchin jelly wasn't far behind. 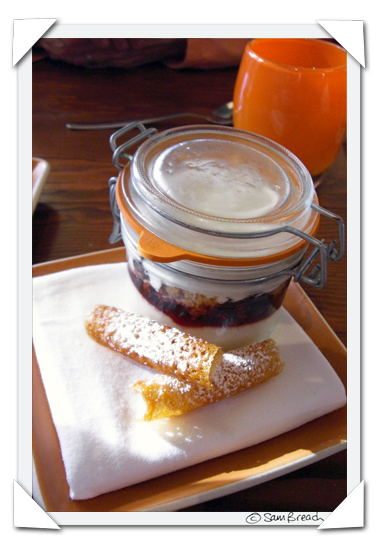 - Was Manresa a part of my original Visitor Guide? Yes! Tried and Tested: will Pim and David adopt me, please? Mum Delivers Her Sentence: I never thought I would manage 18 courses! A wonderful variety of tastes and textures and a wonderful dining experience all-round, particularly when you get to meet the chef. Avoid the mixed drinks and just get a glass a bubbles. Stay only long enough to toast the fantastic view over North Beach, the Marina and the North Bay. - Was The Carnelian Room a part of my original Visitor Guide? No! Back for Seconds: And we'll come again with the next tourists to stay too - but just for one drink and then move on. Mum Delivers Her Sentence: Good view, poor cocktails. We told mum she had to order the ribs. She didn't and was disappointed, perhaps, until Fred let her have one two of his. As she gingerly tasted this deep-fried meat-on-a-bone a huge, unforgettable smile broke out all over her face. - Was Oola a part of my original Visitor Guide? Yes! Tried and Tested: We first dined at Oola on their opening night and recently attended their third birthday party. Mum Delivers Her Sentence: Oola's tuna didn't live up to expectation but I wonder why I didn't order the ribs? At least Fred was good enough to give us some of his. After a tour of Industrial Light and Magic where we met with Yoda, Darth Vader and some stormtroopers we needed somewhere close by and fast for lunch. Pres a Vi hit the spot with a huge choice of sandwiches a choice of huge sandwiches. Prices are more than reasonable, portions are gigantic, service is good and the bread basket (not that you really need a bread basket considering the size of the sandwiches), is wonderful. Especially the long, flattened cheese strips. If I still worked in that neighbourhood, there is no doubt I would be back for more based on this promising first visit. - Was Pres A Vi a part of my original Visitor Guide? No! This was a first impression. Mum Delivers Her Sentence: Too much food for lunch. I was contemplating Zuni, but it was already booked so I took mum to COCO500 for her last meal in San Francisco. I had an exceptional off the menu appetizer - with pork belly, quail wrapped quail egg and little quail legs on the side. We'd eaten so much over the previous week, we couldn't even manage an vacherin between us for dessert. What has my world come to when it has no vacherin in it? No worries - there is always the next time and because it's COCO500, no doubt we'll be back. - Was COCO500 a part of my original Visitor Guide? Yes! Tried & Tested: I'd guess I've eaten at COC500 at least a dozen times by this point. Mum Delivers Her Sentence: My final dinner (I almost feel I've been eating my way around SF). Delightful little spicy taco but quite filling and I could have shared half as a starter. Difficult to choose main course. I opted for beef which was very tender. Service questionable due to some staff inability to understand you don't mix sparkling water with tap water! However, Waiter was good. In case you wonder, we did do a little eating at home along the way too, and I can vouch that my mum now also loves June Taylor tomato ketchup, Fatted Calf Bacon, Soul Food Eggs as well as the recipe for Heidi Swanson's home made muesli and St Benoit Yoghurt. that dining out. Methinks I need a break! Where would you take your family if they visited San Francisco for a week? I also need a break from eating out, I managed to put on a few pounds during those nine days. However, I did enjoy all the interesting dining experiences you organised for me so thank you!! Where I would take a visitor depends greatly on who the visitor is but one place everyone seems to love is the CIA (Wine Spectator at Greystone) in St. Helena. It's lively, colorful enough to be an event, and the food is usually yummy. In San Francisco, currently, I'd take 'em to Sociale. It was great, even on a rainy evening when we sat outdoors. A great read Sam. I wish I was going to San Fransico sometime soon to try some of your suggestions. Chris - I'm still trying to lose the extra kilos I added on my last holiday. Right now my favorites are Tartine and Bar Crudo. I just came down for a eating weekend and those were my favorites. What a great (and obviously difficult) roundup! I'm so glad to have been part of your posse. And! You are so observant. The little cast iron pot were indeed Staub, because I have photographic evidence. So lovely to meet your mum. Cool, thanks, I just came to your website to help me decide a few places to take my british mum and grandma when I'm there in january! Perfect timing!! tatine - well I am a huge fan of their quiche. Ther is no sense denying that. Thank you for the link to my ubuntu article. I really love the idea of a top 8 rather than a top 10. The Ferry Bldg is one of my favorite places to bring out of towners or bridge and tunnelers. Nice group of place you and yours hoped to and fro. Thanks again and keep up the fantastic writing. Jennywenny - you should check the previous post too - since there were some places I took both my mother and grandmother when they visited 6 years ago that we didn't repeat this time - Mamas at washington square for breakfast is a good one, cocktails at Top of the Mark for another great view, Dim Sum (lovely to see my grandmother try it for the first time in her late 70s). Unfortunaltely that dim sum place is no longer there. Hello! 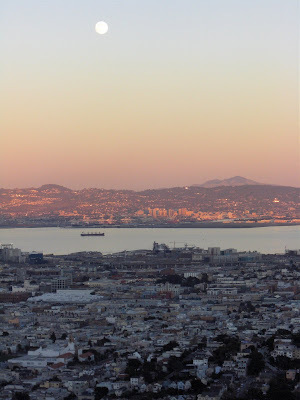 I'm a long-time bay area lurker, and have enjoyed many of the same places that you have. I have a burning question that I'd love to have answered: where do you find the gorgeous Soul Food eggs?? (I live on the peninsula) I had a glorious Soul Food globe of a (steamed? poached?) egg yolk at Coi, enrobed in creme fraiche like a little snowball and adorned with caviar... It was incredible, and I've been looking for the eggs ever since. Thank you! Ah, I noticed the Ferry Building reference in the SFGate article you linked to, so thank you for confirming that the precious little eggs and their more mature relatives can be purchased there!! Yaya's if the restaurant is still there. It's Iraqi food and the flavors are mesmerizing enough for you to imagine that you are indulging right by the banks of the Euphrates. The owner Yaya cooks everything himself, is v unassuming and humble. We picked this restaurant cos we were looking for flavorful slow food. Sadly Yaya's closed. The space is now occupied by Helmand Palace (Afghan, formerly The Helmand of North Beach). You can view my SF choices here . re ubuntu..i went for the medjool date cake with tonka bean ice cream. i have to say that its the best dessert i have had till date*. the cake was soaked in brown butter sauce, iirc and there was a teeccino caramel sauce somewhere that was out of the world. ubutu, like most vegetarian restaurants...makes the mistake of using too much cream/butter for richness. this is not necessary. the cauliflower dish was great...but too rich. I love the reception that you and Fred get when you two go to Cafe Bastille! Also, from your post, it is clear that you showed your mom the best of SF. You are great daughter Sam! What a wonderful post. I am in San Jose and also have a small child. Dining in SF is now limited greatly. So I enjoy hearing the hot spots in the city. 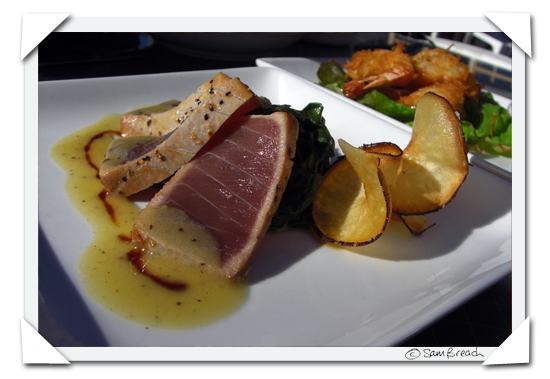 However, I have loved taking guests to Zuni. It is fun and great people watching. A friend and I took our moms there for a birthday celebration (they were in their 70s). The waiter made sure we had a wonderful time and the food is always fantastic. I have also taken customers or simply gone with friends. Thanks again for blogging. "but the potatoes were moreish"
In my Brit ignorance, I am v. curious about this phrase. I'll have to look around the Internet (or beg you to translate). Wait a second--you came to Pres A Vi and didnt introduce yourself?!?!?! Im depressed now. Sam, I would certainly be happy to adopt you if only you'd take me around to all these wonderful places to eat! mum - i saving January for my dieting to commence. zoomie - i went to the CIA once and it was stunning but it was a special event - i didn't realise anyone could walk in - i have never tried sociale - must look into that. barbara - I do wish you could have joined us! dean - thanks for providing me with something to link to! eb - i am a comment reader too, I think it makes you special - so you can find sepcial information! manisha/susanna - too bad about yayas - and susannah - thanks for the link! faustianb - yes you are right the califlower was rich, but since it wasn't actually *my* dish i only had a few small tastes of it so the richness didn't get to me. It may have gotten to its owner though because I recall she might not have quite finished it all. lu - thanks for saying - indeed it was a shame we didnt make it to zuni this time. That won't stop me from visiting it every once in a while - i love Zuni. Jen - Moreish means "I want more. and more and more and more"
richie - I am an anonymous diner!! Kalyn - lets do one of these next time you are in SF, Kalyn. Thanks for the recs! I get to the Bay Area every couple of months, but most of the time forget to give any thought to where I'm going to eat until I'm actually there. I think this time I'll see if I can get a reservation or two in advance! Sounds like Manresa is worth the drive, at least. When my family, aka my father and step-mother came to the Bay Area I asked them to come to the restaurant where I work because that's where I was most of the time they were in town. When my cousin came (she is also a chef) I sent her to a whole list of places including Tartine and Chez Panisse and Boulette's Larder. And if I knew anyone near as adventurous as your mum in my own family I imagine I would take them to many of the restaurants you mentioned. I'm so glad you had a world of fun with your Mum. Sorry I didn't get to feed you or bump into you. i lived in s.f. for sometime and when i visit i love to induldge in dim sum at yous, have some vietnamese food at golden star, some indian food at naan n curry . always a stop at house for a delightful dinner. maybe a jaunt to tadich to see the old men and have a bloody mary and some fondue at luna park.